The National Archives is well known as the guardian of the nation’s historical documents, with 1,000 years of records under its roof. Less well-known is that it holds one of the most important resources for the study of design history, with almost three million designs from the early years of Queen Victoria’s reign through to 1991. We hold these records as the result of a series of copyright acts, starting in 1839, which were introduced to protect ‘ornamental designs’ – the decorative elements of an object rather than its function, which could be patented. 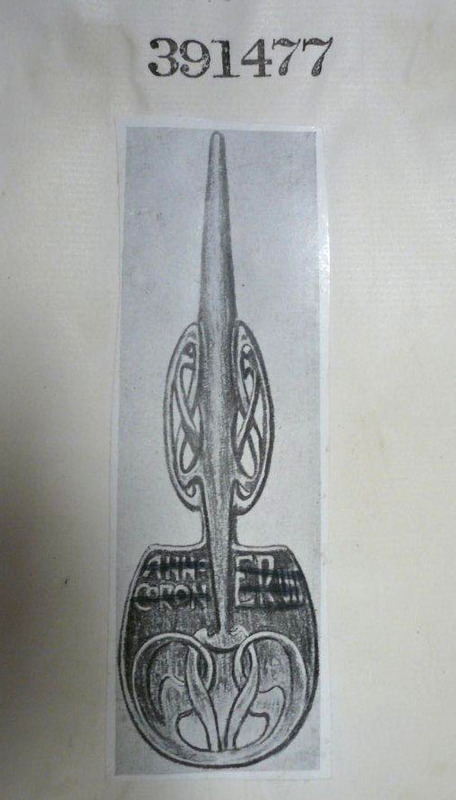 See The National Archives' research guide for help on how to find a registered design. Together the registers and representations give a unique overview of the development of the decorative arts from 1839 onwards. The 19th century and early 20th designs are particularly exciting, with examples of the work of many of the leading designers of the period. Changing tastes and fashions can be traced through the records. The Gothic Revival style, hugely popular in the 19th century, is well-represented, and includes samples of designs by A W N Pugin. The wallpaper below, designed for the Palace of Westminster, shows his use of medieval motifs. William Morris and his followers had a huge influence on design and on the development of the Arts and Crafts movement, helping to promote the idea that the design of furniture and other items for the home had as much right to be considered ‘artistic’ as the ‘fine arts’, such as sculpture and painting. 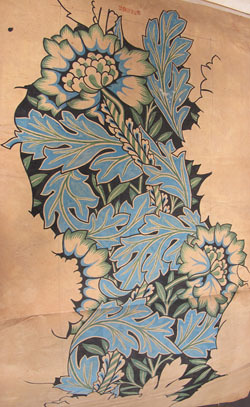 The National Archives holds many Morris & Co samples and some original designs, including ‘Anemone’, shown here. Morris was president of the Arts and Crafts Exhibition Society from 1893 to 1896, the year of his death. Another founder member, and the first president of the Society, was Walter Crane, well-known as a book illustrator as well as being a designer of ceramics, metalwork and wallpapers. We hold a number of samples of Crane’s wallpaper designs at The National Archives, including Swan, Rush and Iris, below. The wallpapers were registered by Jeffrey & Co, which often produced designs by well-known artists and designers and were therefore keen to copyright the work. There are many Art Nouveau designs, many of which were registered by the department store Liberty. These include a number of registrations of Liberty’s ‘Cymric’ silver items. 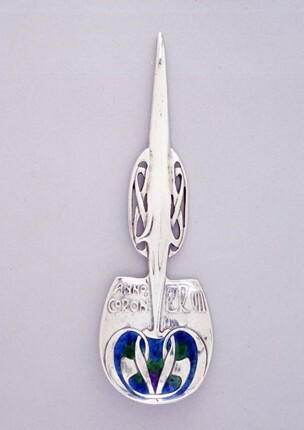 The Cymric spoon shown here was designed by Archibald Knox, possibly to celebrate the coronation of Edward VII – an example is on display at the British Museum. In July 1914 the painter, designer and critic Roger Fry founded the Omega Workshops. The designers who worked for Omega were almost all fine artists, including Vanessa Bell, Duncan Grant and other members of the Bloomsbury group, and they introduced an avant-garde artistic style to domestic design. The Omega Workshops registered a number of textile designs for copyright in July 1914, just before the outbreak of the First World War. The 1930s saw the rise in popularity of Art Deco, with its use of strong colours and angular, geometric shapes. 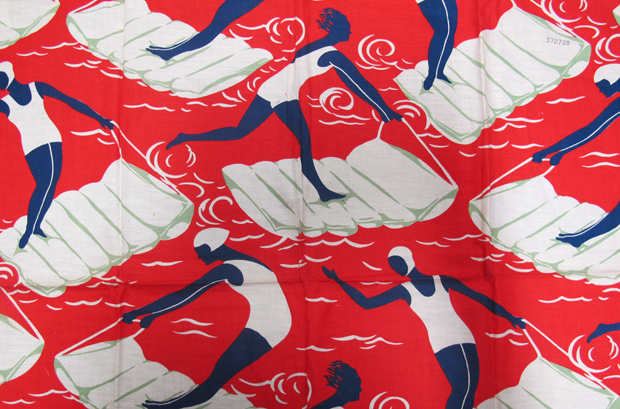 The vibrant design for a dress fabric shown at the top of this blog, ‘Surfers’ (BT 52/5373/372726), registered in April 1937 by the Calico Printers’ Association, typifies the style. The volumes of representations include designs registered by manufacturers and retailers ranging from the elite to the cheap and popular. There are many items to mark the 1851 Great Exhibition, as well as memorabilia related to the Crimean and Boer wars. There are designs for hundreds of ordinary, everyday objects: sentimental ornaments with images of animals and children, smoking-related paraphernalia such as pipes, cigar holders and tobacco boxes, equipment for sewing and letter-writing, cases for calling cards, designs reflecting an interest in the Empire and ‘exotic’ themes, birdcages, candlesticks, and toys. The registered designs are an important record of diverse elements of design history and changing public taste, as well as an amazing resource for the study of material culture and social history.